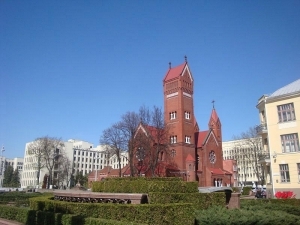 This Catholic church (better known as «Red Church») was build in 1908-1910 by a noble Belarusian family upon the premature death of their two young children. The church with red-brick towers, spires, and pitched roofs became a symbol of inconsolable grief for those who died untimely. When the Bolsheviks came to power, the church became a cinema then a film studio. Only not long ago, in 1990, the church was given back its original status. Services here start at 7 p.m.